The Kūhistoni Badakhshon Autonomous Region (Tajik: Вилояти Мухтори Кӯҳистони Бадахшон, Viloyati Muxtori Köhistoni Badaxšon/Vilojati Muxtori Kūhistoni Badaxşon, ولايت مختار کوهستانی بدخشان; also known as Gorno-Badakhshan, after Russian: Горно-Бадахшанская автономная область, Gorno-Badachšanskaja avtonomnaja oblastj) is an autonomous region in eastern Tajikistan. Prior to 1895, the area of today's Gorno-Badakhshan A.R. consisted of several semi-self governing statelets, including Darwaz, Shughnun-Rushan, and Wakhan, who ruled over territories that today are part of Gorno-Badakhshan A.R. in Tajikistan and Badakhshan Province in Afghanistan. The territory was claimed by the Chinese and Russian empires and the Emirate of Afghanistan. The Qing rulers of China claimed control of the entire Pamir Mountains, but Qing military units only controlled the passes just east of Tashkorgan Town. In the 1890s, the Chinese, Russian, and Afghan governments signed a series of agreements that divided Badakhshan, but the Chinese continued to contest these borders, until it signed a 2002 agreement with the government of Tajikistan. When the civil war broke out in Tajikistan in 1992, the local government in Gorno-Badakhshan declared independence from the Republic of Tajikistan. During the civil war many Pamiris were targeted for killing by rival groups and Gorno-Badakhshan became a bastion for the opposition. 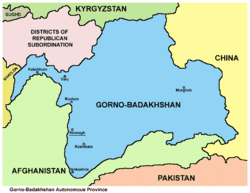 Later the Gorno-Badakhshan government backed down from its calls for independence. 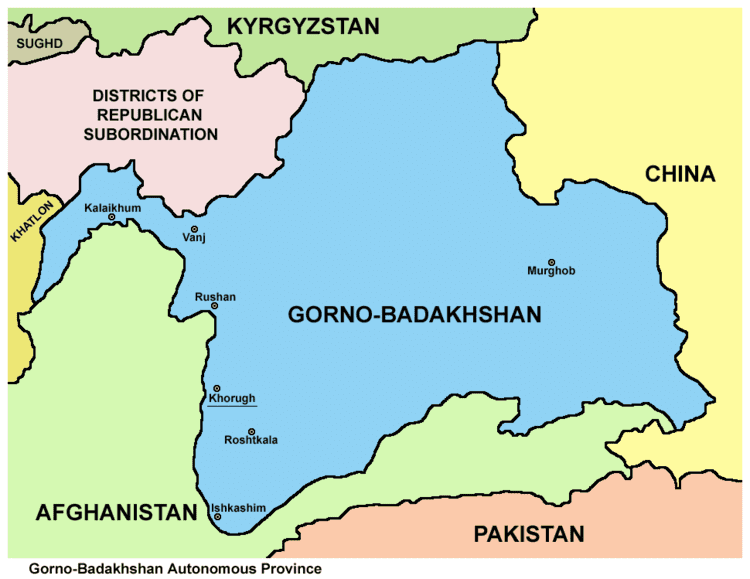 Gorno-Badakhshan remains an autonomous region within Tajikistan. 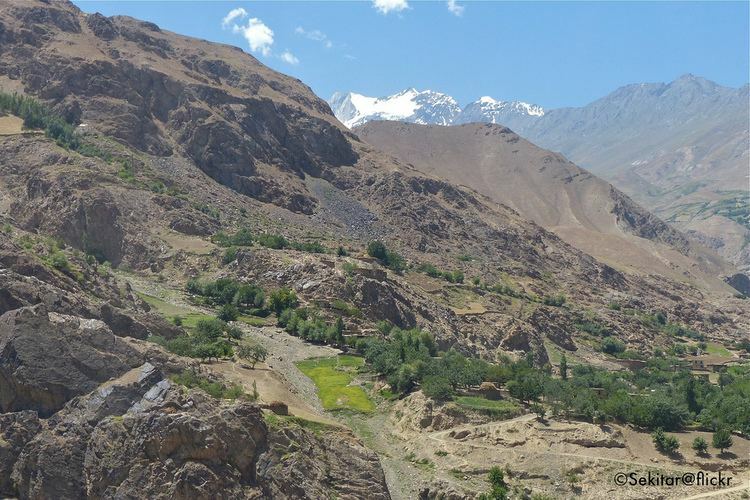 In 2011, Tajikistan ratified a 1999 deal to cede 1,000 km2 (390 sq mi) of land in the Pamir Mountains to the People's Republic of China, ending a 130-year dispute, and the relinquishing of China's claims to over 28,000 km2 (11,000 sq mi) of Tajikistani territory. GBAO covers all the eastern part of the country and borders the Xinjiang Uyghur Autonomous Region of China in the east, the Badakhshan Province of Afghanistan in the south, and Osh Region of Kyrgyzstan in the north. Within Tajikistan the region's western border is with the Districts of Republican Subordination (DRP) and the tip of its south-western finger (Darvoz District) borders on Khatlon Region. 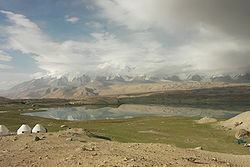 The highest mountains are in the Pamirs (ancient Mount Imeon), which is known as the roof of the world, and three of the five 7,000 meter summits in formerly Soviet Central Asia are located here, including Ismoil Somoni Peak (formerly Communism Peak, and, before that, Stalin Peak; 7,495 m), Ibn Sina Peak (formerly Lenin Peak, and still known by that name on its Kyrgyz flank; 7,134 m), on the border with Kyrgyzstan, and Peak Korzhenevskaya (7,105 m).